Can someone please clarify if weakened soul still increases critical strike chance for its duration? I looked through all my abilities and couldn't find anything that would suggest it does, so I think they removed the ability. I noticed you didn't include Penance in your Atonement section. It is now included in Atonement and is a great damage/heal to use during periods of low or non-existant damage where you don't need to maintain Grace on the tank. As MadMonk stated, this is gone it seems. I've been toying with the idea of using twist of fate as atonement on any boss that gets a damage increase at lower hp (berserk/enrages). Sadly I don't raid with my priest, but i will try to get into a RF DS to test it out. Best boss to test this on would be Warmaster Blackhorn or Ultraxion if you can grab the green orb. Edit: Tested and atonement DOES get double effect from it, possibly making it the best talent to take on any fight with adds, players constantly falling under 20% hp, or bosses dealing increased damage at low hp. Have you done any testing with Flash Heal/Greater Heal? They both cost the same amount of mana now and the difference in healing between them is small enough that it might be better to just stick with Flash Heal. Unless of course its being used with Inner Focus then I say go with GH. 41,000 Healing with Grace at 3 stacks. Faster casting reduces Weakened Soul faster. Applies more Spirit Shells and is faster to apply. 54,000 Healing with Grace at 3 stacks. Applies fewer Spirit Shells but bigger. This was all done unbuffed with no weapon enchant. Cool! Thanks for pointing it out. I'll make a mention of it both in the talents page and in the rotation page. Honestly, I think the old rule still applies: Greater Heal as the go-to for heavy healing, Flash Heal in an emergency. Using Flash Heal isn't as ruinous to your mana as it was, but I think the rule still holds. Even if you're trying to apply Spirit Shell, in fact (unless you need to apply X amount of absorption before a certain moment, in which case Flash Heal may be better). I am curious why mastery is rated above haste for AoE healing. While Spirit Shell does scale with Mastery, with the hard cap being based on our health...you do not need a ton of mastery to hit it. When SS is on cd you would go with AA/PoH which would scale better with haste (faster application of both healing and DA) and crit (double-dip on DA). I am possibly missing something, so just thought I would ask. It is actually funny that you would mention this. Before Mists of Pandaria, I was always a fierce advocate of Haste for Discipline Priests. I like Haste for more than just the throughput, but also for the precision and control that it offers you. With Mists of Pandaria, I went against my "gut feeling" of recommending Haste again, and decided to recommend Mastery based on the things I noticed on the Beta so far. The main reason, I would say, is not Spirit Shell, but the fact that casting Power Word: Shield is much easier to do. Mastery benefits you directly there. It also means you get more Borrowed Time uptime, meaning that fewer casts overall need to be affected by Haste. This is of course for a general/single target priority. For heavy AoE, I believe it is quite possibly a toss-up currently between Haste and Mastery. Perhaps it can be boiled down to the same discussion we had in Cataclysm (Mastery = absorb more; Haste = get the AoE heals off faster, which means you could get the second heal in before the next tick of AoE damage). Stat priorities for healers are always problematic, as I'm sure you know. This is the case even more so now that we are in a transition between level 85 and 90 scaling. I'm definitely keeping a close eye on these stats, and I'm personally rooting for Haste. We are pretty much on the same page then. Throughout Cata I have favored haste since while Mastery did/does affect shield (and other absorbs though not as highly imho), I find that my raid's biggest "sticking point" so to speak has always been raid damage rather than tank damage and I feel haste gives more bang for the buck with that. That may change at 90, obviously, but for the moment with the new skills, I am still finding that haste gives me more. Going all mastery gives me only about 4k to my shield and about 500 absorb per PoH DA. For me, the slight increases to shield strength aren't worth the greater cast times. Thanks for the reply, I am rooting for Haste as well. edit: I am the above poster, I just was not registered before. i don't use Spirit Shell that often, and when i do it seems to screw me over rather then help me. Somehow i must be using it wrong, be it bad timing, or incorrect use. Whats the best way to use it? Is it better for aoe or single target? Should it not be used for one of them? also do inner focus or archangel affect it? you show crit last but when I put in my toon to check mr robot as this guide suggests, it shows crit first which is confusing. its using the default pve setting on mr robot. You can be quite creative with Spirit Shell, but in essence, if the target(s) you want to use it on just need healing (meaning that they have already sustained damage), then it is hardly worth using. It's best used when you anticipate damage that will occur on someone, and you want to dampen it before it happens. This could be when you know that a boss ability is going to hit the tank, or when you know that a big burst of raid damage is going to come and you want to pre-shield a lot of people (not to mention you get some Divine Aegis stacks). We have just finished reviewing and updating all of our DPS spec stats. We are going to focus on the tanks and healers next, so this issue should be resolved. But in any case, for Discipline Priests, it's very much up to preference, assignment, and healing style in general. i am a tailor, but i dont have enchanting. i didn't like using it and gave up on it. I want to get a gathering profession and i wanted to know which bonus from them is best for a disc/shadow priest. should i take herbalism or skinning? None of the gathering professions are particularly good for raiding, sadly. Both Skinning and Herbalism offer tiny benefits, but really, if you are concerned about raid performance, get a crafting profession. Did a fair bit of revamping of the stats and gems/enchants pages for Disc Priests, guys. Ha, right you are. I hadn't even noticed this. I remember testing things in late Beta, and hadn't noticed it then, so perhaps it was changed afterwards. In any case, I'll update the place in the guide where this is relevant. Are there guides like these for Cataclysm? 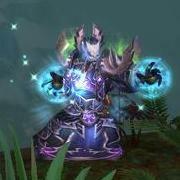 I've rejoined the game after last playing in WotLK and I'm really quite lost as so much seems to have changed for playing (solo levelling and heroic healing) with my Discipline priest. I think reading about the Cataclysm changes to rotations first might help me understand things a lot better! in Rotation, Cooldowns, and Abilities at 4.2.4. Train of Thought there is a minor typo. Your Smite reduces the remaining cooldown of Penance by 0.5 secpnds. seconds, not secpnds. Not that it realy matters much but someone would probably point it out eventually.